Elefant d'Or International Circus Festival Until the 19/02/19. Girona is strongly committed to attracting top artists from all over the world to leave us spellbound with memories that will last a lifetime. Ladies and gentlemen, welcome to the greatest circus show. The Elefant d'Or International Circus Festival is one of the best events in the world for experiencing up close all the magic of trapeze artists performing pirouettes at great heights; riders performing unbelievable acrobatics on horseback; jugglers with amazing reflexes; tightrope workers defying the laws of physics; prestigious ballet dancers; guaranteed laughs with clowns and many other breathtaking attractions. The Elefant d'Or International Circus Festival has established itself as one of the leading cultural events in our country, following in the footsteps of other great circus festivals, such as those of WuQiao, Budapest, Monte Carlo or Paris. Girona is strongly committed to attracting top artists from all over the world to leave us spellbound with memories that will last a lifetime. Throughout the festival, in addition to performing for the general public, the participating artists compete to win the Gold Show (the name of the festival’s grand final) before an international judging panel composed of well-known figures from the circus world. Building on the success of the previous festivals in Figueres, the infrastructures are in place to handle a large-scale festival of this nature, to which visitors flock in large numbers. So make sure you note down the dates and don't miss the next one! 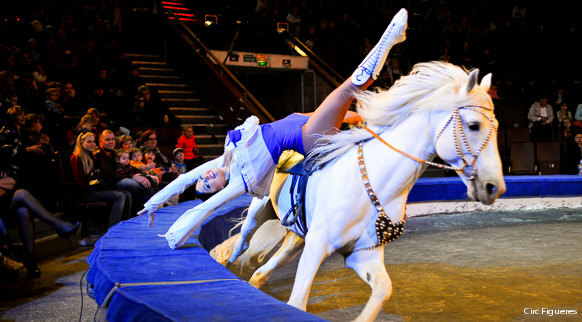 For a few days in February the capital of Gironès becomes a huge circus that's sure to amaze you.